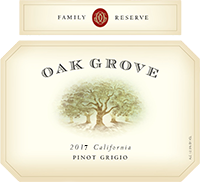 One of the more popular wines in Italy, the Oak Grove Family Reserve Pinot Grigio is the perfect wine for entertaining with family and friends. It’s flavors are light and lively on the palate with lemony citrus notes, and has a refreshing, very clean finish. Lighter bodied yet full of flavor, try as a first course with chilled prawns, or serve along side antipasti in a festive setting.